Toyama City is the capital of Toyama Prefecture, located in the Hokuriku region in Japan. It is a major urban area with a population of approximately 420,000, and is famous for its efforts to be a compact city. Japan for Sustainability has previously introduced Toyama's progress to readers, including its introduction of a light rail transit (LRT) system and its efforts to be a model environmental city. As the population is decreasing, a big question is how Toyama can become more attractive as a place to visit and live while being sustainable as a city? We interviewed Masashi Mori, Mayor of Toyama, who has been instituting his many creative and innovative ideas one after another since he was elected to office (like his "Bring Flowers on the Train and Ride for Free!" promotion), while also working on the serious business of scaling down and improving facility management in the city. Mayor Masashi Mori: "In Toyama, as the population is decreasing, we are trying to create an environment where as many people as possible are tempted to come into the central areas of the city, and make the shift from being a society that depends heavily on automobiles to one that encourages people to use public transportation more frequently. "In this depopulating and aging society, if we don't take any action, the results of calculations on demographic trends clearly show that the burdens shifted onto future generations will continue to grow, including things like the costs for city road maintenance, management costs, and premiums for nursing-care insurance. Therefore, I have determined to take action for future-generation citizens before it's too late, even if this sometimes displeases the current citizens. "If we consider that Japan's population decline will lead the country to slowly shift to what it should be, now may be a great time to think seriously about how the city should be like in the future. However, if we don't make strategic moves while carefully looking ahead to the future, the population, in particular those of provincial cities, will decrease at an accelerated pace, and I believe that the gap between cities will be wider within five to ten years. "One of the most important things is to manage the city while accurately comprehending the realities of its actual situation. For example, it is not enough for the city to increase the number of "business bachelors" (workers who leave their families elsewhere to work here for extended periods) when we try to attract new enterprises. We must also have their family members come to the city to live together. To this end, it is necessary to clarify how to become a city that can be selected by company members and their families to work and live in, and then actually make the efforts to become such a city. If our city can do this, even if depopulation can't be stopped, we can at least make it happen slower. As a result, young people would come to think that, "I do not have to worry about the future as long as I live in this city." This is a very important issue. "For these reasons, the Toyama City government has been doing many things to heighten the attractiveness of the city. 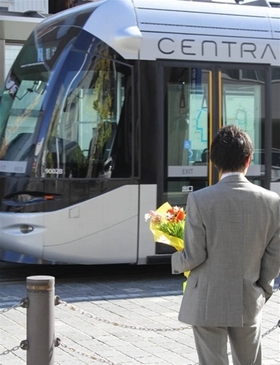 For example, Toyama has Japan's most advanced LRT system and a bike-sharing system like in Paris. And the central areas of the city are decorated with flowers, which is a program paid out of the city budget. In addition, you can take a train for free if you buy a bunch of flowers in the city and take it with you onto the train. Cool idea, isn't it? "For ten years, I have been thinking about how to make Toyama more attractive and then implementing my ideas. If depopulation is unavoidable, then I would like to at least mitigate the population decline rate in this city, so that young citizens can feel secure. I would also like company members' families to select our city to live in. If these goals are realized, a sustainable strength can be generated. We can maintain vitality, invite investment, and inevitably increase tax revenues, even in this provincial city. "In Toyama, foreigners can take the LRT for free, and visitors from areas outside Toyama Prefecture pay half price. This shows our hospitality. The city government has a plan to build public facilities around the LRT and also invite private investment. As a result, the land value of the central area would rise, and eventually the tax revenues -- the city's main financial income -- would also increase. "The loop LRT started operation in December 2009, and the three-year data show that the number of female passengers has increased. Most notably, the number of passengers aged 65 or over increased by as much as 61 percent. This shows that the LRT has created opportunities for them to go out, and the main purpose for them to visit the city center by LRT is to go shopping. Over the three years studied, the duration of stay in the center of the city has grown longer by 15 percent and the amount of purchases has increased by 20 percent. "I do not consider the loop LRT as a mere transportation device. It can stimulate people's lifestyles and thereby make many more senior citizens healthy. To create a highly sustainable city, it is important to avoid increasing the number of senior citizens in need of nursing care. This will alleviate the burden of today's young people. Thinking about things this way, I am putting many interesting things into action. "One example is our 'autumn city tour led by female university students' for senior citizens. This event aims to have senior citizens walk with the aid of, for example, a safe assistive device with a brake, which was jointly developed with the University of Toyama. Another example is admission-free facilities. When grandparents visit the Family Park, museums or other city facilities with their grandchildren, they are given free admission. The grandchild must be pleased, too, saying something like, "My mom buys me a soft ice cream just once, but I'm glad that my gramma buys it for me three times or more." (laughter) Grandparents must also be pleased to go out with their grandchildren more often. Don't you think so? In addition, we provide senior citizens an opportunity to grow vegetables in community parks in the city center. Seeing vegetables growing can inspire more vitality in senior citizens. It may be a good idea to hold get-togethers to cook the vegetables and eat them together with community members, including children. "The number of people moving out of the downtown area used to exceed the number moving in. But, as a result of our efforts to revitalize the area, those numbers have been reversed for five consecutive years. The number of elementary school students in the downtown has also turned from a decrease into an increase, although the total number of elementary school students in Toyama is still decreasing. "Also, with the aim of encouraging more people to live along public transportation routes, we have specified areas near train stations or bus stops downtown and in the suburbs as "recommended residential areas." The areas consist of 436 hectares of downtown land, as well as a total of 3,090 hectares in 19 areas along the public transportation routes (within a 300-meter radius from a bus stop and a 500-meter radius from a train station) in the vicinity of Toyama Station. As part of a project to promote downtown settlement, we provide a subsidy of one million yen (U.S.$10,638) per condominium residence and 500,000 yen ($5,319) per single-family house. Likewise, as part of a project to promote settlement along the public transportation routes, we offer a subsidy of 700,000 yen ($7,447) and 300,000 yen ($3,191), respectively. "Under the Toyama City master plan, we aim to increase the proportion of the population in the areas along the public transportation service from 28% in 2005 to 42% in 2025. So far, the proportion has reached 31%. By proceeding with our compact city strategy in this way, we will be able to help reduce citizens' burdens in the future. "Another noteworthy issue is that while land prices in Toyama as a whole are falling, just like other areas nationwide, prices in the downtown have remained unchanged. Looking at the composition ratio of tax items from among the whole revenues of the city, the ratio of residential taxes has been decreasing, whereas the ratios of fixed property taxes and city planning taxes have been increasing since the collapse of the Lehman Brothers in 2008. Falling land prices means a decrease in tax revenues; thus, it is very important that the downtown's land prices remain steady. "While the area of the downtown accounts for only 0.4% of the whole city, it contributes 22.2% of the city's total revenues of the fixed property tax and the city planning tax. In this respect, investment in the downtown is the most rational option. While adequately explaining this fact to citizens, we make selective and intensive investments. It is particularly important to provide explanations to suburban residents. With adequate explanations, we can help them understand and think something like, "I'm not completely happy with this, but I will live with it." It is said that what is required of governments is "accountability," but achieving accountability alone is not enough. What is really needed is "responsibility for convictions." Governments must convince people who express opposition. After overcoming this, we should bring forward policies that will be necessary for the benefit of citizens. That's a responsibility of government. "Another important thing is that it will be too late for governments to take action if they wait to obtain all people's agreement. What is crucial is that even if there are people who oppose our plans, we can eventually persuade them through our belief and conviction. As a way of taking responsibility by public officials, we pursue our plans even if there is opposition. It is important to set out this stance. "In the latest election, I won my fourth victory with 86% of the votes. I think that's because my efforts were understood well. Our compact city project has been well under way, and then, in order to spell out specific measures for facility management, we set up a staff team in the municipality office two years ago, and since then have been carrying out concrete studies on it. "Considering the shrinking population, it is necessary to minimize the construction of new roads and bridges, as well as to continue to use existing public facilities by properly maintaining and repairing them. At the same time, it is also necessary to promote the consolidation and even elimination of some public facilities. According to a study by Professor Yuji Nemoto of Toyo University, in Japan's typical urban cities with a population of 300,000 or more, the area of public facilities, including gymnasiums and schools, is 2.8 square meters per citizen, whereas in Toyama City, the area is 3.8 square meters per citizen. So, it is very costly to maintain all facilities, and it is impossible to repair all of the aging buildings. "At the least, I need to clearly inform citizens of this fact. As one of my commitments before the latest election, I clearly stated my intention of implementing changes to facility management. We have already eliminated facilities that were attracting few visitors, but hereafter we must evaluate the facilities that are still being used. This is going to be a formidable task. "We will create categories, like (a) facilities that will be used as long as they are usable but will not be renewed; (b) facilities that will be used for another 20 years; and (c) facilities that will continue to be necessary. Then, we will classify each existing public facility into categories like 'this facility falls under (a),' and 'that facility falls under (b).' I want to complete this task during my four-year term as mayor. I always say that one of my responsibilities in this term is to carry out the unpleasant things. To promote measures for the sake of future citizens, I have to deal head-on with opponents who want to maintain the status quo. "Nonetheless, we have no intention of eliminating every facility. We don't want to cut the number of branch agencies that enable us to communicate with citizens in the local areas, as well as community centers, libraries, and so on. In order to secure the financial resources for maintaining these facilities, I want to streamline others. At the same time, if we ask citizens to endure the pain arising from the promotion of better facility management, we also need to reduce personnel expenses for our staff and make other efforts. Even so, cutting their salaries would affect their motivation, but Toyama has reduced its personnel expenses by 11% from the fiscal 2005 level without cutting staff salaries. "Specifically, we reduce personnel expenses by reducing their overtime work. In our municipal office, electric lights are turned off at 6 p.m. After that, employees who need to work overtime can turn on lights they need by themselves and continue working, but they are allowed to do so only until 8 p.m. at the latest. It is undesirable for female staff that have elementary school-age kids to work until 10 or 11 p.m., isn't it? I am taking action to shift to a culture where our staff can have a better work-life balance. "These efforts have been recognized, and in June 2012, Toyama was selected as one of the five most advanced compact city models of the world by the Organization for Economic Co-operation and Development (OECD). Our efforts were highly evaluated as a model of compact city strategies that should be implemented in a depopulating and aging society -- which some East Asian countries will become in the future. Today, we are increasingly being invited to United Nations conferences and other international conferences overseas." Through this interview, I recognized very well that Mayor Masashi Mori has a combination of abilities to properly analyze data on the current situation, predict the future, bring forward exciting ideas, provide appropriate explanations to citizens, and persuade them to accept change. I also understood that this is why the city of Toyama has seen positive results in building a city that provides a sustainable and happy life for its citizens, even in Japan, which has become a depopulating and aging society ahead of other countries. I will continue to watch with interest Toyama City's future development and its effects on other municipalities.